What Can I Do To Attract Wildlife Into My City? Watch and listen to our Co-Founder Ian Boyd speaking about the nature of cities and how our research is making city wildlife ecosystems a reality. Film by The Royal Society of Biology at New Scientist Live 2017. The Rise Of The Multistory Rockpool . We've come a long way since our first artificial rockpool was deployed in the intertidal zone of the Solent back in 2013. We call them Vertipools and today we have three different designs available for installation on concrete sea defences and harbour walls. In the studio at the moment we have a new Vertipool design on the drawing board which we're expecting to field test early next year. This latest Vertipool unit is being developed with the added objective of prolonging the life of the wooden groyne structures to which it will attach. This summer saw an addition to our growing list of artificial seashore habitats with the installation of our first ever vertical intertidal mud vessel. The 'Mud Bin' (working title) was installed in the Medina Estuary as part of ferry company Wightlink's recent port alteration works. We'll be following the Mud Bin's progress over the coming months and will report progress as soon as we have news. We now have concrete intertidal Vertipools successfully deployed in Bournemouth, Sandown Bay, Yarmouth IW and Crammond Edinburgh. All of the artificial pools are colonising well and providing high rise habitat for intertidal sea life. Our objective of buying time for seashore ecosystems with the onset of sea level rise looming seems to be paying off. 10ltr Vertipool in Crammond Scotland. Artificial rock pool habitat. One of Artecology’s founding ideas is called ‘Punctuated Intervention’, based on an important principle in landscape conservation that we can summarise as the ‘not everything is everywhere’ rule! What this means is that wildlife isn’t evenly distributed in the world around us. The density of biological activity is almost always patchy; through a wood, or in a pond, or across a field, in a park or in a garden. A butterfly will spend lots of time making very short journeys around a particularly good feeding or egg-laying spot and then skip the intervening space as it flies 100m to the next. A bat might travel 10km to feed at its favourite pond but bypass many small woods and meadows on the way. A population of ground beetles might flourish in the scuffed bare ground at one end of a school playing field but be completely absent from the other. The usefulness of the habitats around us varies, and consequently landscapes are necessarily composed of patches of differing ecological value. Some will provide just one of many options for wildlife and are easily replaced if damaged or disturbed (for example a general getting from A to B), others may be a vital and singular resource (for example the only pond in the neighbourhood). Looking at places in this way helps us to concentrate our efforts on the best and most sustainable results. If we can manage small, and sometimes very small, patches of environment to provide high density wildlife activity then we can help to build up ecosystem resilience by increasing the number of ‘hotspots’ available to species and their local populations. If we space these enriched patches to suit the dispersal abilities of particular target species, or an assemblage of invertebrates, reptiles, amphibians, small mammals and songbirds, then, in the jargon of the moment, we can deliver ‘net gain’. This is Punctuated Intervention. The great thing about PI is that organizations can deliver real improvements for wildlife even within the limited funding now available for environmental work, and set these within an existing maintenance regime without complicating contracts and annoying contractors! Even better, it is possible to begin to apply those very maintenance routines to landscape punctuation, stretching existing budgets for better results. Small things really can make a big difference. At Artecology we're used to tackling very big 'real world' problems. Some of our current projects (particularly coastal ones) are expanding in size and scope, so as we prepare to upscale our operations we are aslo mindful of the importance of thinking and working small! Artecology is very often about designing and creating little changes to the urban environment, small interventions that have a big positive effect on the local ecology of the space in which they are deployed. 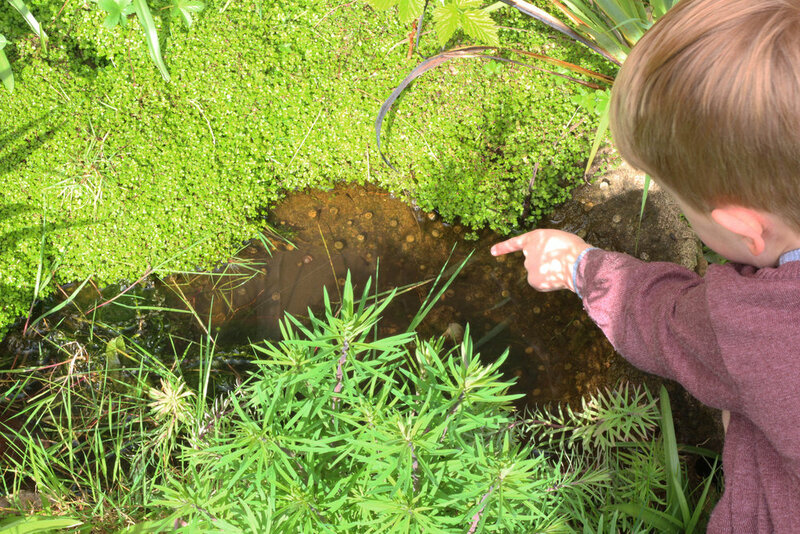 Our miniature earth-cast freshwater pools are a great illustration of how small interventions can yield big results. Made from Natural Argillaceous Concrete the pool is designed with a large structural surface area. This 'Tardis Effect' has been achieved through clever use of textured interior surface detail. In just 10 litres of water an astonishingly diverse array of aquatic and semi-aquatic flora and fauna has colonised the pool photographed in less than 18 months. The water perfect for wildlife, it's clear and perfectly balanced and is also a hot spot for inquisitive children for whom the pool poses absolutely no threat or danger but does provide a wonderful close up aquatic wildlife encounter. Life has found a way in our tiny urban freshwater pool. Artecology Isle of Wight's first ever TV appearance.....Newsround! The Artecology team were up in Edinburgh recently as part of a coastal habitat collaboration with a fantastic set of partners including Edinburgh Botanic Gardens, Glasgow Uni and the Scottish Wildlife Trust. The team's trip involved installing artificial rockpools and bio-tiles, presenting on Artecology at Edinburgh Botanic Gardens and probably best of all, a series of schools engagement sessions including the genius pupils from Forthview Primary School. BBC Newsround have just featured one of the school sessions in this magic film, interviewing the kids as they learnt how to create rock pools on the sea defences near Cramond. Here's their take on climate change, coastal adaptation and biodiversity. Great interview also with Glasgow Uni's Mairi MacArthur who works with us on the bio-tiles project. SEE THE SHORT FILM HERE! Yesterday was the IW Biological Recorders' Conference at Arreton, hosted by the excellent IW Natural History Society http://iwnhas.org/. It's the annual gathering of naturalists, conservation organizations, ecology professionals and amazing volunteers, with great displays, fascinating talks and plentiful cake! It really is a fantastic and inspiring event - so many dedicated people sharing ideas, information and a boundless enthusiasm for wildlife. This year our friends and colleagues from Bournemouth University, Dr. Roger Herbert and Alice Hall, presented results from their research on 'Recording and enhancing marine life on artificial structures'. Alice talked about the Bouldnor and Boscombe Vertipools, and the Yaverland tyre pools, showing data on the ecological enhancement value of Artecology as a retrofit to existing marine infrastructure. It was a fascinating lecture and provoked much interest and comment from the audience, continuing right up to the close and carrying on into the car park afterwards! There is so much exciting work ahead, so much to learn and apply and so many possibilities to explore. Artecology is a great place to be just now! Eels are amazing! The European eel breeds at sea, but migrates into our rivers to grow before returning to the sea to spawn some 6 to 20 years later. The first three years of the European eel’s life are spent drifting in the ocean as a larva. It is thought that all European eels spawn in the Sargasso Sea, in the western Atlantic. At some point in their young lives the eels decide to head across the Atlantic Ocean for our rivers and streams and therein lies a problem! Man made weirs and culverts in our rivers and streams present a real barrier to the eels and sometimes they need a helping hand so they can make their way through the obstacles and onward to their destination up stream. 'Eel passes' are an established method that can help the eels by giving them a surface they can push through and grip on to in order to negotiate the weirs and culverts. Our 'Love Eels' retro fit tiles are about to be tested for the first time. The eye catching 3D 'Heart and Dart' ornamentation is designed to catch the attention of humans as well as allowing eels to get a grip when they need to most. Our new tiles will draw attention to these extraordinary animals and provide the possibility of an astonishing wildlife encounter that few people have ever seen for real. A section of the Heart & Dart design by paper artist Hannah George, sculptor Nigel George and Ecologist Ian Boyd. The workbench at the Artecology studio during the Eel Pass tile prototyping. Director Nigel George working on a birch pollen hibernaculum. Artecology was recently commissioned to create a series of sculptures for The Pan Meadows Country Park on The Isle of Wight. Why just have sculptures when you can have sculptural hibernacula we thought! So, each one of these giant pollen grain sculptures is hollow and stuffed with a variety of organic substrates that will provide a perfect sheltering and overwintering place for a variety of vertebrate and invertebrate wildlife. Pollen hibernaculum sculptures in progress in the Artecology studio. Artecology Ltd's founders Ecologist Ian Boyd and Public Artists Nigel George where recently asked to speak to the Environment Agency at their Romsey HQ. Ian and Nige took along examples of current Artecology projects and talked through a slideshow showing the benefits of using Artecology principles as good practice for future civil engineering developments. EA representative Claire Hamilton later remarked that - "I had such positive feedback from the group. They thoroughly enjoyed it and said it was the best lunchtime presentation they had attended for ages! It was refreshing to have a presentation where passion rather than money was the main driver. People also said Ian and Nige were great presenters and very inspirational!" Nige and Ian now have a number of positive project leads to follow up as a result of their presentation and discussions that followed with EA personnel. Watch this space!! Properly understanding materials is incredibly important for us at Artecology. Developing sculpting and construction media that is both workable from an artistic point of view and strong from an engineering standpoint is a constant challenge. We're always testing and developing materials that can withstand the rigours of life in the public and natural realms. This week at our studio we've been testing high performance concrete mixes using recycled aggregates to make a workable medium that is both very strong and very sculptable. Materials testing in action at the Artecology studio. 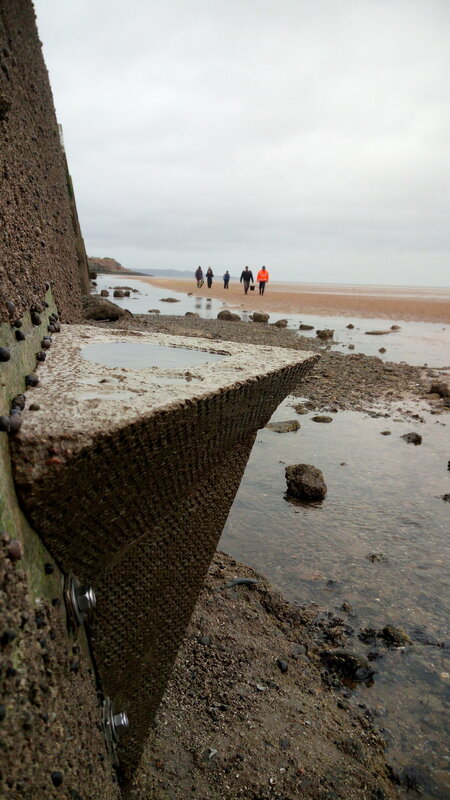 Collaboration is at the heart of everything we do, our work with the design and creation of BioArmour for sea defences is no exception and a great example of how this works. Work on the project began with Larissa Naylor, a geomorphologist from Glasgow University who introduced us to the concept of bio armour. As the project has unfolded we've extended the collaboration to include paper artist Hannah George. 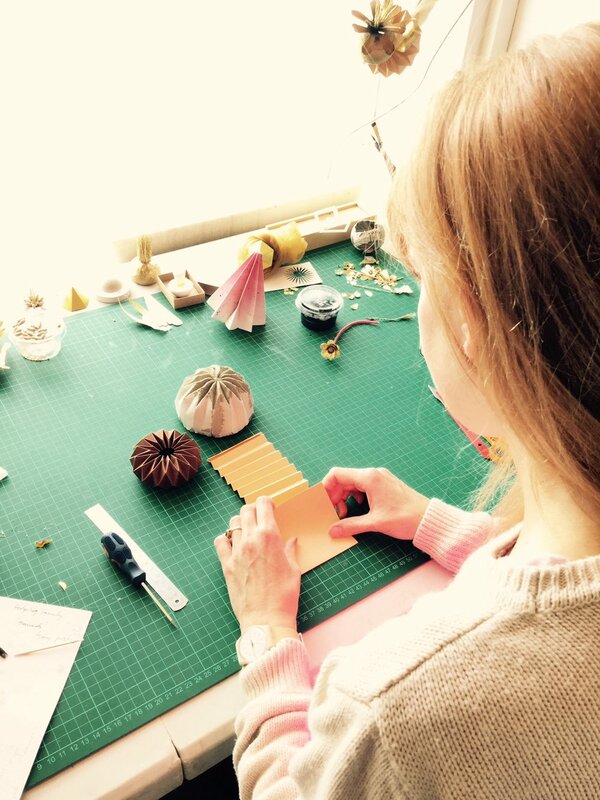 Hannah specialises in paper sculpture and has been helping us with some of the textured tile designs needed for the bio armour project. Hannah George at her studio on the Isle of Wight.